Mange In Dogs - These Tiny Mites Can Cause Big Problems! 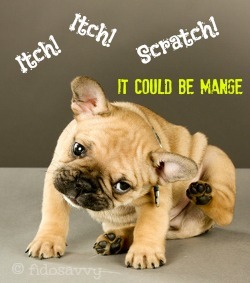 Canine Mange is caused by tiny little skin mites.. but although they're small they can make poor Fido really miserable! These microscopically small mites are responsible for the itching, rashes, irritated skin and hair loss that characterize mange. Sarcoptic Mange (also known as Scabies or Red Mange) which is caused by the sarcoptes mite. Both types cause skin problems, but there are important differences. There are three types of demodex mites, but the one that is most commonly seen is the 'Demodex Canis'. The mites live in your dogs' hair follicles and this is the most common form of mange in dogs, and is most often seen in puppies. In fact, most puppies will have this type of mite (passed to them by their momma), but they generally don't cause any problems in healthy puppies. However, if a puppy's immune system is challenged (eg. by illness or stress), the extra strain weakens immune function, the mite population grows and skin irritation and hair loss start to develop. The resulting mite infestation then causes further strain on the pup's' immune system, and a vicious circle begins. Some breeds seem to have a congenital predisposition to being affected in this way, and are more likely to become 'symptomatic'. These include Shar-Peis, Bull-Terrier breeds, Old English Sheepdogs, Pugs and Dogue de Bordeaux. Demodectic mange IS NOT generally thought to be contagious, so it can't be passed from dog to dog, or from dog to human. But some scientists believe that it may be possible for certain types of demodex mites to be passed from dog to do, under certain conditions, but there's no scientific proof of this at present. This type of mange is a condition that is almost exclusively seen in puppies or young dogs under 9 months old. If an older or mature dogs starts to develop demodicosis, chances are good that he has an immune-system problem or underlying health condition. There are 3 versions of demodectic mange (or demodicosis), Localized, Generalized and Pododermatitis. The symptoms of Localized Demodectic Mange generally show up as isolated patches of thinning hair, or baldness in puppies. Most often these first appear on the face , particularly on the muzzle or around the eyes. Sometimes small patches will also be seen on the chest or front legs. This patchy hair loss MAY also reveal scaly or irritated skin, and your pup MAY itch (but not necessarily). Anywhere up to about 4 'bald spots' is termed localized, and about 90% of the time this type of mange clears up by itself without any treatment. The exception to this is if there is a history of mange in your puppys' canine family. When there's a genetic component involved, the chances of mange in dogs improving without treatment drops to about 50%. 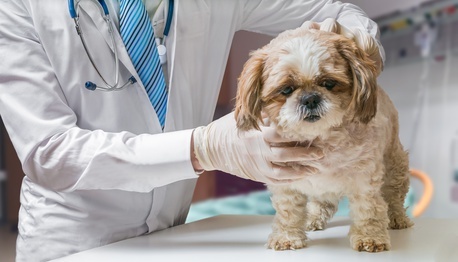 However, if your pup is diagnosed with localized demodicosis and you don't see any improvement within a couple of months, it could have progressed to the generalized form. Generalized demodectic mange in dogs results in several, widespread patches of thinning hair or bald spots, and more widespread skin irritation. There's usually significantly more irritation involved with generalized demodicosis, and your pup may seem very itchy and uncomfortable. Constant scratching and licking at the affected areas can also make the discomfort worse, and even set up secondary infections. Although even with this generalized form of demodectic mange in dogs, up to 50% may recover without treatment. But because of the level of discomfort, risk of infection, and general 'unsightliness' of this condition, treatment is usually recommended. This is a condition when the mange affects a puppys' paws. It can cause bacterial infections and be very uncomfortable, even painful. The symptoms of mange in this instance include hair loss on the paws, swelling of the feet (especially around the nail beds) and red/hot/inflamed areas which are often infected. Treatment is always recommended for this sort of demodectic mange, and it can take several rounds of treatment to clear it up. Mange needs to be diagnosed by your veterinarian. He/she will take a small skin scraping, and look at it under a high-powered microscope. If your pup has mange, the mites will usually be visible in the scraping, even though you can't see them just by looking yourself. If your vet decides treatment is necessary, there are options, including topical treatments, oral treatments. There are also natural treatment options for both demodectic and sarcoptic mange. Click here to learn more about this. For mild cases of localized demodectic mange, using a 1% rotenone ointment (Goodwinol), or a 5% benzoyl peroxide gel might work. This needs to be applied daily to the affected areas. Also bathing your pup with a benzoyl peroxide shampoo can help. For more severe cases, and generalized mange, the most common treatment is with Mitaban anti-parasitic Dip. This product contain Amitraz which kills the mites. Giving your pup a bath using a Benzoyl Peroxide shampoo BEFORE the Mitaban application helps improve it's effectiveness. You can get a prescription from your vet for Mitaban dip, or your veterinarian may 'dip' your pup for you. It usually takes many dips to kill all the mites (sometimes up to a dozen or more). Mitaban can have adverse side effects on dogs, and on humans, who have certain health conditions or are taking certain drugs. Also tiny and toy breeds can be extra-sensitive to Mitaban and caution should be used when treating them. Never use these products without discussing it fully with your vet first! For pups or dogs that can't be treated with Amitraz, some vets may use the heartworm medication known as Interceptor, the ingredient Milbemycin in this product has also been found to be effective against demodex mites. However, this can be an expensive form of mange treatment, as it needs to be given daily rather than monthly (as is normal for heartworm prevention). However, it is an option for dogs who can't be treated any other way. Another alternative treatment for mange in dogs, is the broad spectrum anti-parasite medication, Ivermectin. This isn't approved by the FDA for treating mange, but is often used by veterinary dermatologists and professionals. It is usually given orally on a daily basis, and is very effective. However, Ivermectin should never be given to herding breeds (eg. Border Collies, Australian Shepherds, Old English Sheepdogs, Shetland Sheepdogs etc. ), herding breed mixes, white German Shepherds or old/elderly dogs. You can learn more about Ivermectin sensitivity in these breeds here. 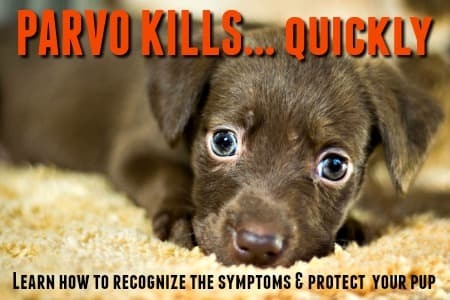 Dogs or puppies should also test heartworm negative before being given this medication. Treating Pododermatitis can be difficult and may require a long-term regimen. The Mitaban dips and Ivermectin mentioned earlier are the most common treatments, and Milbemycin is also used. In many cases antibiotic treatment is also needed because the irritated skin become infected easily. This type of mange (also called 'Scabies'), is caused by the Sarcoptes Scabei mite. Rather than living in the hair follicles on the surface of the skin (as in Demodectic mange), the female of these tiny mites burrows right down into your puppys' skin and lay their eggs there. Not surprisingly, this causes severe itching, irritation, inflammation and often infection. The symptoms are very similar to an allergic reaction, and you might at first think your pet has allergies. Excessive scratching, licking, and biting at the the skin, and redness, inflammation and/or irritation are common. Red, scaly, itchy skin and it tends to show up in areas where your dog naturally has less hair - such as the belly, ears flaps, inside the legs etc. Although sarcopctic mange usually starts off in these localized areas, it tends to spread quite quickly and eventually the whole body can be affected. Sarcoptic mange IS contagious, both between dogs and between dogs and humans. Other animals can also be affected. Because these mites can survive for several days in the environment, direct contact with an affected dog isn't vital to the transmission. However, the sarcoptes mites don't tend to stay on humans for long and although they cause intense itching at the time, it is usually fairly short lived. 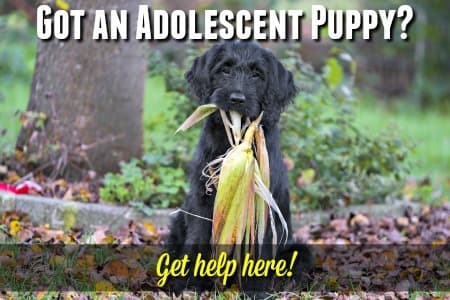 If your dog has sarcoptic mange and you or your family members get 'itchy' or develp a rash (looks like tiny insect bites), definitely go to your doctor for evaluation. Taking a skin scraping and examining it under a microscope is how your vet will diagnose Sarcoptic Mange. But due to the nature of the life-cycle of these mites it can be more difficult to get an accurate diagnosis, than it it with Demodectic mange. Sometimes several tests may have to be done over a period of several weeks. Treatment for this type of mange is always necessary, and many times a veterinarian will prescribe treatment as a precaution, even if a firm 'positive' diagnosis hasn't yet been made. If your pup shows signs of type of mange in dogs, don't take a 'wait and see' attitude - have your vet examine him/her. Although sarcoptic mange in dogs is generally more serious than demodectic mange, there are several effective treatment options available, these are basically the same treatments as used for Demodectic mange. The most common mange treatment for the sarcoptes mite are Mitaban baths or dips which contain the antiparasitic agent Amitraz. A Lime-Sulfur Dip is also often effective against sarcoptic mange. Ivermectin (although not approved by the FDA for treating sarcoptic mange and should never be used on herding breeds of any type), and Milbemycin (Interceptor or Sentinel for heartworm prevention) are also commonly used. Other possible mange treatments that have been found to be effective, include Revolution and Advantage Multi, all these are more commonly used to treat heartworm, fleas, ticks and other parasites. For full information on these treatments, see the paragraph on demodectic mange treatment above. Because sarcoptic mange tends to cause more severe irritation and skin problems than demodex, bacterial and yeast infections may also develop. This means that treatment for this sort of mange often also includes antibiotics and anti-fungal medications. As you can see from the info. 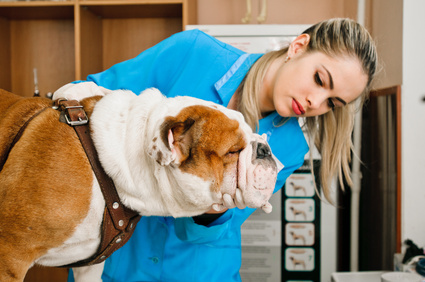 on this page, most treatments for mange include a fair amount of chemicals... and depending on how severe your dog's infestation is, they may be absolutely essential. BUT, there are some more natural treatments and products for treating Canine Mange. There is a third type of mite which can cause your dog (and more often your cat) problems. That's the Ear Mite.